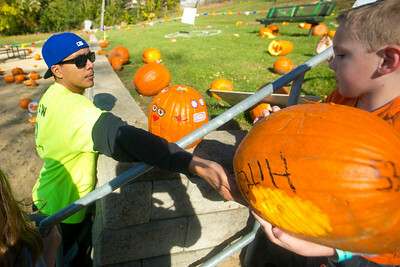 Daryl Quitalig - For Shaw Media Alex Zewde, of Elgin, Lake in the Hills Recreation Supervisior, hands a rolled pumpkin to Logan Hitch, 5, of Lake in the Hills, to roll down the hill again after competition rolls during the second annual Great Pumpkin Roll Saturday, Nov. 5, 2016, at Butch Hagele Beach in Lake in the Hills, Ill. Children were able to roll pumpkins down the hill and those closest to designated markers or farthest rollers won prizes. 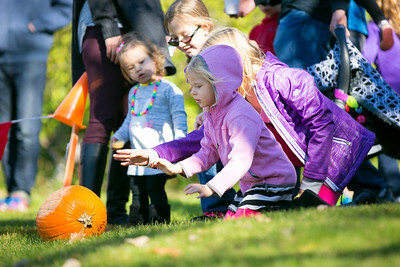 Daryl Quitalig - For Shaw Media Avery Tazbier, 4, of Lake in the Hills, pushes her home-brought pumpkin down the hill with assistance from her sister Addy, 8, during the second annual Great Pumpkin Roll Saturday, Nov. 5, 2016, at Butch Hagele Beach in Lake in the Hills, Ill. Children were able to roll pumpkins down the hill and those closest to designated markers or farthest rollers won prizes. 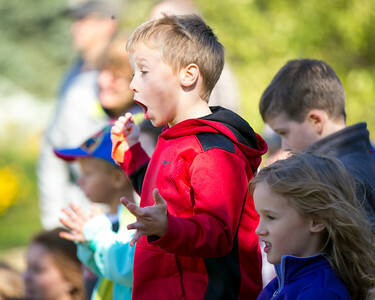 Daryl Quitalig - For Shaw Media Owen Clough, 6, of Crystal Lake, reacts to his pumpkin rolling amongst others during the second annual Great Pumpkin Roll Saturday, Nov. 5, 2016, at Butch Hagele Beach in Lake in the Hills, Ill. Children were able to roll pumpkins down the hill and those closest to designated markers or farthest rollers won prizes. 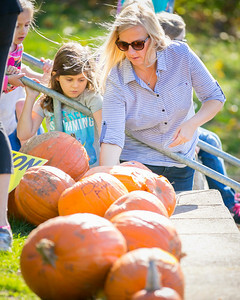 Daryl Quitalig - For Shaw Media Christina Hitch (center), of Lake in the Hills, inspects some of the rolled pumpkins with her niece Maddy Wickersham, 7, of South Elgin, during the second annual Great Pumpkin Roll Saturday, Nov. 5, 2016, at Butch Hagele Beach in Lake in the Hills, Ill. Children were able to roll pumpkins down the hill and those closest to designated markers or farthest rollers won prizes. Daryl Quitalig - For Shaw Media Pumpkins roll down the hill during the third heat of the 6-and-over age group during the second annual Great Pumpkin Roll Saturday, Nov. 5, 2016, at Butch Hagele Beach in Lake in the Hills, Ill. Children were able to roll pumpkins down the hill and those closest to designated markers or farthest rollers won prizes. 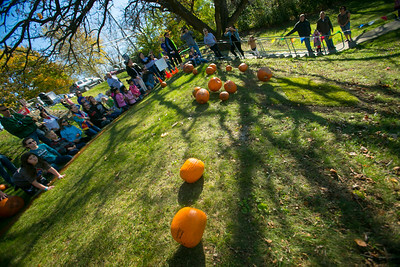 Pumpkins roll down the hill during the third heat of the 6-and-over age group during the second annual Great Pumpkin Roll Saturday, Nov. 5, 2016, at Butch Hagele Beach in Lake in the Hills, Ill. Children were able to roll pumpkins down the hill and those closest to designated markers or farthest rollers won prizes.